XP-Pen Artist15.6 is a good pen display for artists who are looking for a Cintiq-like experience. The resolution of the screen is very standard at 1920X1080, it’s good for the 15.6 inch screen XP-Pen Artist15.6 has. The screen color gamut is okay too (the range of colors it can display), particularly if you don’t care much about colors (it’s good enough). It supports 8192 levels of pressure, but doesn’t support tilt, a feature that most Cintiq alternatives don’t support. Please keep in mind that XP-Pen Artist15.6 doesn’t come with a stand, and that’s one of the reason it’s affordable. You can buy a stand separately if you really need it, or you can just make one or prop it against something on your desk. It’s really nice that XP-Pen Artist15.6 can be powered up from USB port, that mean it could be used completely without a power outlet, and directly from a laptop, assuming your laptop can provide enough power to it. You still have the option to plug it into the wall in case that’s not possible. Just like the case with Cintiq Alternatives, there’s a screen protector that covers the screen. It causes friction when you draw, which makes it easier to draw lineart. You can remove it if you like. Whether you kept the screen protector or not, you don’t have to worry about the cost of replacing the nibs, as they come in packs of 100. Something none of the other pen displays makers I know do. The pen holder doubles as nibs remover tool, which is the standard nowadays with drawing devices like pen displays. The pen itself is triangular, this could make it harder to use. The fact it costs little to replace is encouraging too. As long as you order XP-Pen Artist15.6 while expecting possible issues, like from the driver or because of parallax, you will be fine. Especially in case you’re prepared to deal with parallax (I explained parallax in details in the review below). If you wonder about the differences between XP-Pen Artist15.6 & XP-PEN Artist16 Pro, I have dedicated a section just for that, click here to get to it. Generally speaking, XP-Pen pen displays are some of the most affordable in the market so far, even more so that Huion. What Are The Differences Between XP-Pen Artist15.6 & XP-PEN Artist16 Pro? One of the most affordable 15.6 inch pen displays, if not the most affordable. Can be powered via USB port, making it possible to carry it & power it from a laptop. Nibs are so cheap, so there’s no need to worry about replacement costs. Doesn’t come with a stand, which can be purchased separately (it could be the reasons it’s very affordable too.). Parallax may be annoying for you. Comes with the PN03S pen, a passive pen that requires to battery or charging. Has 6 hot keys you could customize to do the functions you need. Windows Compatibility:- Compatible with Windows 7, Windows 8 & Windows 10. Works with many drawing software like Adobe Photoshop, Corel Painter, Adobe Illustrator, Clip Studio Paint, Krita, Paint Tool Sai, Medibang & more. 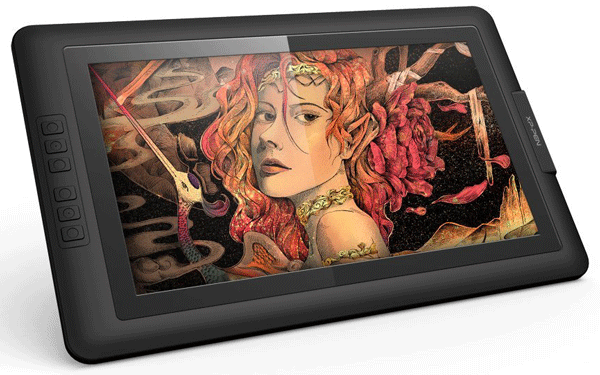 XP-Pen Artist15.6 has a 15.6 inch screen, a huge size for the price you pay for this pen display. It also provides you with a good drawing area, particularly if you are upgrading from a smaller pen display. The screen resolution is 1920 X 1080, you may want more resolution like that, but this resolution is totally fine for drawing, while ensuring the icons won’t get so small, something very high resolution like 4K cause to art program (unless the program is made to support 4K resolution). When it comes to colors, XP-Pen Artist15.6 supports 75% Adobe RGB, which makes it equivalent to Cintiq 13HD (Reviewed here), but it’s not as good as the latest Cintiq models. It’s not exactly a bad gamut, especially if you’re not particular about colors, and you can always check your colors on your other monitor, I here assume that your second monitor has a higher color gamut. You will likely need to calibrate the colors to make sure it match your main display, you can also check colors on your main monitor (I here assume you’re using a monitor with better color gamut than XP-Pen Artist15.6). The screen specifications above are very standard for Cintiq alternatives, with the exception of screen size, which varies from 10-inch to 22-inch. 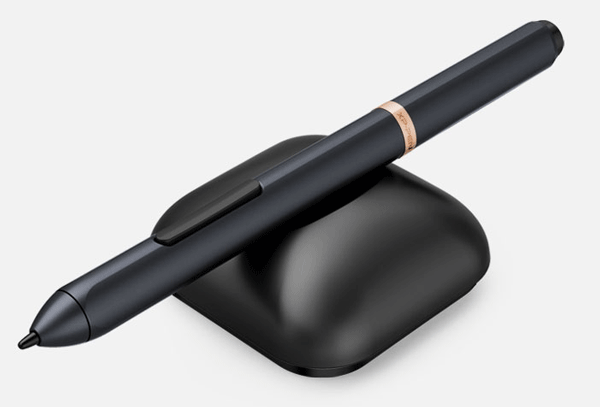 You connect XP-Pen Artist15.6 to your computer via the 3-in-1 cable, which connects to it via the USB-C interface on it. USB-C is only used on that side, you only need to have the regular USB port on your computer. You may be wondering if you’re wondering if XP-Pen Artist15.6 can be connected directly to your computer via a USB-C-to-USB-C cable, the answer is no. You need to use the 3-in-1 cable for that. XP-Pen Artist15.6 doesn’t support tilt sensitivity, which allows you to tilt the brush you’re drawing with (assuming the brush & drawing software you’re using support it). Most artists won’t need that feature, but it would be nice to have. So far, this is a function you would go to Wacom devices to use (and pay the premium price), as they don’t usually come in non-Wacom devices. The drawing area XP-Pen Artist15.6’s screen offers is good, it’s the sweet spot between the small but portable pen displays (around 13-3 inch), and the much bigger ones (like 19-inch & above). If you tend to draw with your wrist, you won’t have much of an issue, if you want to draw with your arm length, you could do that to a degree, but it’s better to have larger drawing area. 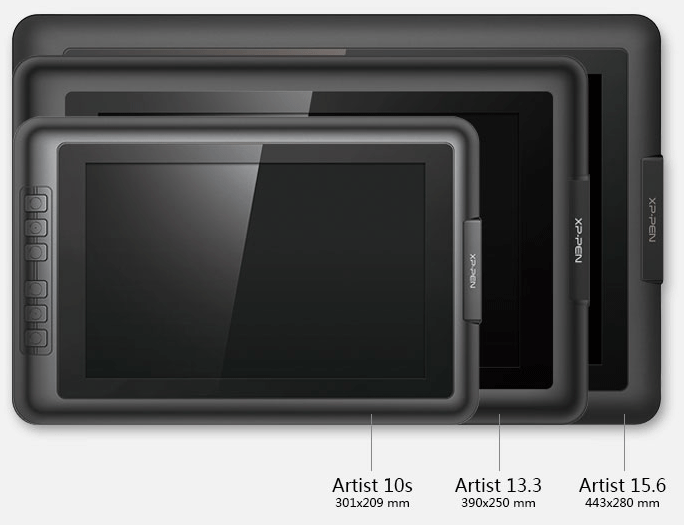 In general, 15.6-inch screens combines portability and drawing area. There’s one issue related to drawing that may cause you to dislike XP-Pen Artist15.6, which is parallax. Parallax is an offset between the pen tip & the cursor on the screen where strokes actually appear, and it is apparent around the screen corners in many digitizers, including XP-Pen Artist15.6’s. It makes it annoying & less natural to draw on the screen (yet still faster than regular graphics tablet). Calibration makes this more manageable, especially calibrating the best way. Even after calibration, there’s a good chance you will have parallax, but it will hopefully be more manageable. As a rule of thumb, you should be mentally prepared to face this issue the moment you decide to get XP-Pen Artist15.6. Here’s a video showing parallax in action, the video showing it on a different pen display from Wacom (Cintiq 27QHD, which I reviewed here), but it will give you a good idea on how parallax is. As you can see, it’s very common to have parallax for most pen displays that connect to your computer. If parallax is something of a big issue for you, then I highly suggest you try drawing devices with a different digitizer, like Surface Pro, but keep in mind that drawing with it is a bit different). Also, the iPad Pro doesn’t have parallax too (as long as you’re fine with iOS application), you can read my full opinion on drawing with the iPad in this post. There’s a screen protector attached on XP-Pen Artist15.6’s screen, this protector makes the screen matte, and so it won’t reflect light & act like a mirror. The screen protector adds texture to it, which causes friction with the pen as you draw, this makes it easier to draw lines & the like. You will either like or dislike the screen protector, the issue with the screen protector is that it cases the pen tip (or nibs) to wear down faster, I always counted that as a con in my reviews, but since the pen nibs are very cheap & sold in packs of 100, I don’t think this is a big issue (it costs much more to replace nibs for other pen displays). If you don’t like the screen protector, you can always remove it, and then draw on the screen itself. Keeping the protector or not is a trade-off you need to think of. In case you decided to keep the screen protector, XP-Pen doesn’t provide you with a replacement it case that wore down too. But you can get a 3rd party protector, and there are varieties to choose from. 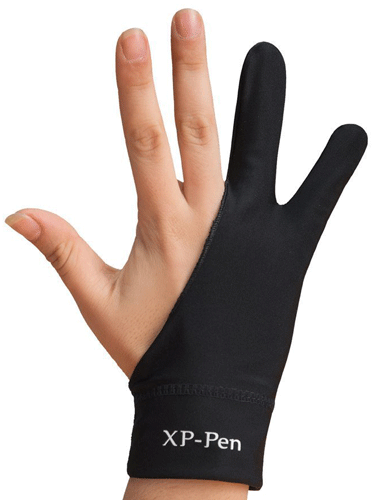 XP-Pen Artist15.6 comes with an anti-smudge glove, which only covers the lower two fingers of your hand (similar to the one you see in the picture above), which is the part of your hand you place on XP-Pen Artist15.6. So your hand won’t get to stick on the screen & hinder your movement, and to prevent your hand from smudging the screen as well. None of these issues particularly damage the screen, but they could make it harder to draw. A glove like that is particularly more useful with pen display with touch screens (XP-Pen Artist15.6’s screen doesn’t support touch). On the side of XP-Pen Artist15.6, there are 6 hot keys for you to customize. You can assign these buttons to different shortcuts from within the driver. If you use a lot of keyboard shortcuts, then you may rather use the keyboard for that. You have two options to power up XP-Pen Artist15.6, you can plug it to the wall via the included adapter, or to plug it to a USB port on your computer. Which mean you don’t need a power outlet to use it with your laptop on the go. For that, just make sure your USB port can supply enough power to XP-Pen Artist15.6. There are two things that are worth noting about XP-Pen Artist15.6’s pen. The first is that it’s a passive pen, which means it doesn’t require a battery or charging to work. 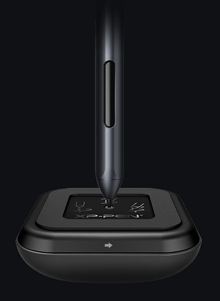 XP-Pen is probably the only maker, besides Wacom, that makes pens like that. The other thing I should mention is the pen shape, which is triangular. This could make it harder to grip, especially if you’re used to the circular pens from Wacom & other makers. 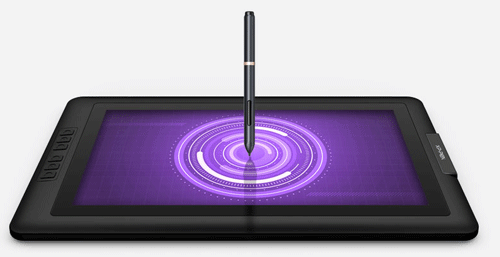 There are 2 buttons on the side of the pen, a standard feature in graphics tablets & pen displays. You could customize these two buttons like the hot keys. Buying a replacement pen is cheap in case you happened to lose or break your pen, something that costs a lot with Wacom. XP-Pen Artist15.6 comes with a pen holder, where you could place the pen when you’re not using it. There are 8 replacement nibs inside the pen holder, which can last you for some time, depending on how much you press the pen on the screen, and whether you decided to keep the screen protector. You could make nibs last for a long time if you knew about this. Even in the worst case where nibs wear down fast, XP-Pen sells these in the pack of 100, so they’re super cheap to get. The pen holder doubles as nibs remover, where you insert the nib in the hole in it in order to remove it. This has been a trend since 2017, since Wacom introduced that feature in their Intuos Pro 2017 (I reviewed that here if you’re interested). Before that, nibs used to be removed using a small picker that looked like a ring. If you’re considering buying XP-Pen Artist15.6, there’s something you better know beforehand, which is the fact it doesn’t come with a stand at all. You may not mind that, as you can place it on your lap, or to just prop it against something on your desk. You can buy the stand separately if you like to, or get a 3rd-party stand. It’s worth noting that XP-Pen Artist15.6 is an affordable version of XP-PEN Artist16 Pro, which is a bit more expensive that comes with a stand as well. That’s partly why the lack of a stand could be one of the reasons XP-Pen Artist15.6 is so affordable. If that’s the case, then it’s a nice way to reduce the cost of it. I will discuss the difference between the two shortly. 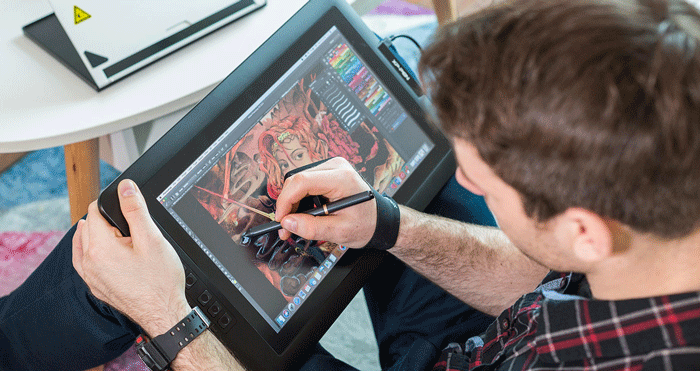 XP-PEN Artist16 Pro comes with stand out of the box, the stand allows you to tilt it between 15°-85°. You can also remove the stand for a 75 X 75 VESA stand as well, which allows you to mount it to an arm (a nice thing to do with a drawing pen display). XP-PEN Artist16 Pro has 8 hot keys, rather than 6 you get with XP-Pen Artist15.6. One important thing to do before you do anything with XP-Pen Artist15.6’s driver is to uninstall any Wacom driver from your computer, and even drivers from other makers, like Huion, Monoprice, Gaomon & Ugee. This is an important step to avoid all sorts of problems with this. It’s so important that I keep repeating it over & over in this blog. We do that just in case, to rule out the possibility of driver conflict. While comparing the driver installations of Wacom drivers & non-Wacom, I don’t try to make one look better or anything, they all can have some annoying driver issues. Wacom has advantage of offering older drivers, while with other brand, you get 2 versions with the other brands, the one with the CD, and the one you could download from the website. It’s always advisable to use the one from their site, but you could try the one in the CD in case the one you downloaded didn’t work. If you’re lucky, XP-Pen Artist15.6’s driver will be installed with no issue whatsoever, but being cautious about it won’t hurt. In case you encountered an issues with driver, either overall or with particular drawing software, installing & installing may help too. Customer support will try to help if you contacted them, sometimes it won’t work, but they really try. They may send you a replacement unit in case yours is defective. While you could get a small Cintiq under $1000 & maybe less, XP-Pen Artist15.6 is nice if you’re really strapped for cash. The screen is bigger than the Cintiq you could get for much higher. This is the reason I like having affordable Cintiq alternatives like this (although regular graphics tablets are also good for those cases too, but drawing on screen is nice).